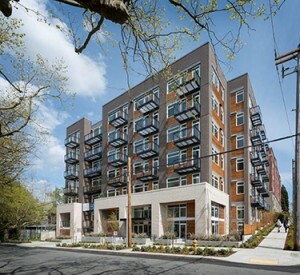 Leasing is under way at a new 70-unit apartment building called Stream Belmont at 500 Belmont Ave. E. on Capitol Hill. Stream Real Estate LLC is the developer and owner of the six-story building. NK Architects designed the project and Compass Construction built it. The team also included Yu & Trochalakis, structural engineering; CT Engineering, shoring; and Karen Kiest|Landscape Architects. Construction cost between $9 million and $10 million. NK said Stream Belmont’s contemporary design mixes durable brick and composite materials with natural cedar siding. The units are mostly studios and one-bedrooms ranging from 461 to 750 square feet. There is one 2-bedroom unit with 1,071 square feet. Units have high ceilings and large windows. Rents range from $894 to $2,700, and 80 percent of the units are leased. There are 36 below-grade parking stalls, and a rooftop deck with views of downtown and the Olympic Mountains. The project is targeting LEED-H gold. Units come with high-efficiency Energy Star appliances; LED and fluorescent lighting; water-saving plumbing fixtures; and paints, sealants, adhesives and carpet that are made with no- or low-volatile organic compounds. Reverse cycle air-to-water chillers capture ambient air in the garage to heat water for the building, a system that NK said is 75 percent more efficient than traditional boilers. In addition to LEED certification, Stream Belmont was constructed with a net-zero carbon footprint. The developer is a founding partner of Forterra’s C3 program, which will help offset Stream Belmont’s carbon footprint during construction and operation of the building. In the C3 program, Cascadia Consulting calculates a project’s footprint during construction and ongoing operations. Then developers pay for planting and maintaining native trees in protected public spaces.